With a GPS tracker that had us going round in circles, the signage for Mary's is non-existent. A slight red glow around the doorway with a nondescript guy in a hoodie (security perhaps) is hovering in the laneway. Expecting to enter through the doors, we are stopped midway but chaos reigns with seeing our gal pal in the entranceway, air kisses galore, we manage to scamper on in. Only to find out a few moments later that a strict quota is enforced, if the bar is at capacity, no one can go in until customers leave. Even at 7pm Thursday night, the music is blaring, the dark grungy bar is roomy with a queue of people at the bottom of the stairs waiting to dine at the mezzanine level. Advised that it was going to be at least a 45 minute wait, we grab an order of beer (Young Henry's on tap, yes please), wine and cocktails (Knicker Dropper) perhaps a sign of the night to come? Letting the waiter know that we're a group of 6 meant that we required to be physically there in person to be seated. Even with 3 gal pals waiting in the cold outside wasn't enough, we had to be inside the establishment. Tough rules at this joint. With the constant stream of people entering and leaving, we were left scratching our heads as to what the rules were with half our party were waiting outside. Confusion central. 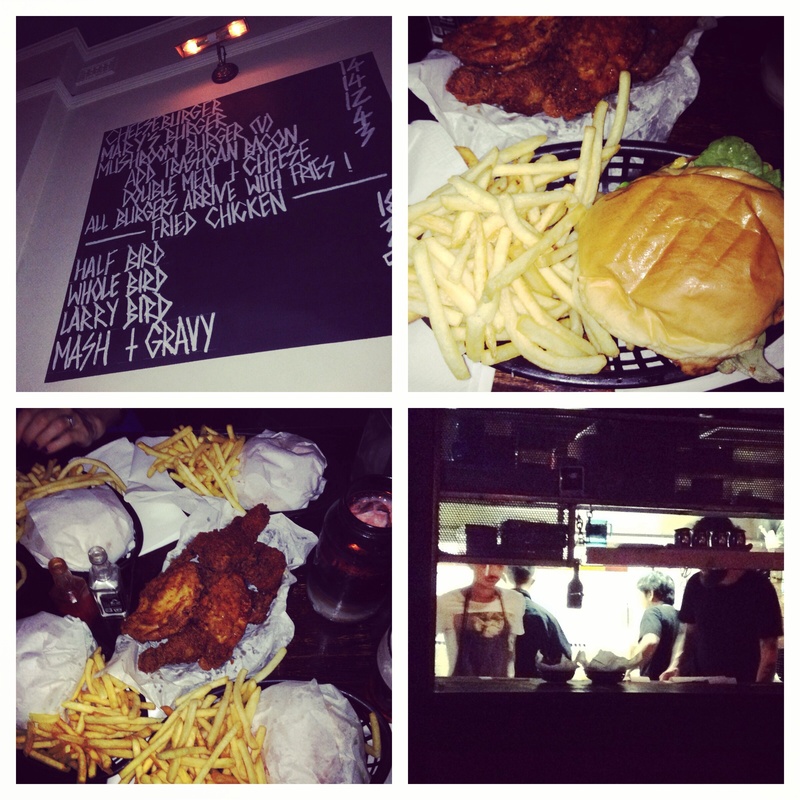 The menu is short and sweet displayed high up on blackboards, with the choice of either burgers or fried chicken. This is a place that's serious about their burgers- cheeseburger, Mary's burger, even a mushroom burger for the vegetarians. The must try item is the piping hot crunchy crumbly fried chicken with a kick of spice. Even with half our group outside who were minutes from entering, the carnivore in us couldn't wait and ordered a whole chicken in addition to 6x Mary's burgers for the table. 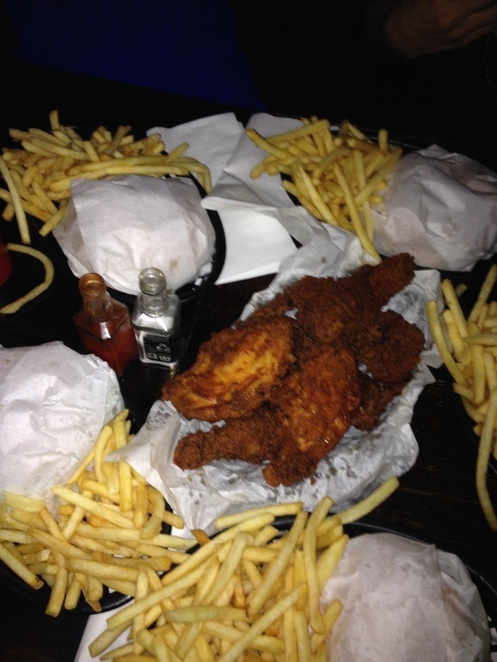 Our order arrived piled high on a large shallow basket with the burgers wrapped in greaseproof paper with a pile of skinny fries in individual plastic baskets. There was silence at the table as we chomped our way through our Mary's burger with its sweet silky soft bun encasing the minced meat patty, lettuce and tomato, smokey note mayo. For those needing an extra kick, hot sauce is available in miniature mini bar sized Jack Daniel bottles. Tomato sauce is supplied in a red squeezie perfect with those skinny fries. The crowd is definitely hipsterville with the prerequisite of tattooed sleeves. Mary's is simply decorated with tasteful graffiti on the walls. 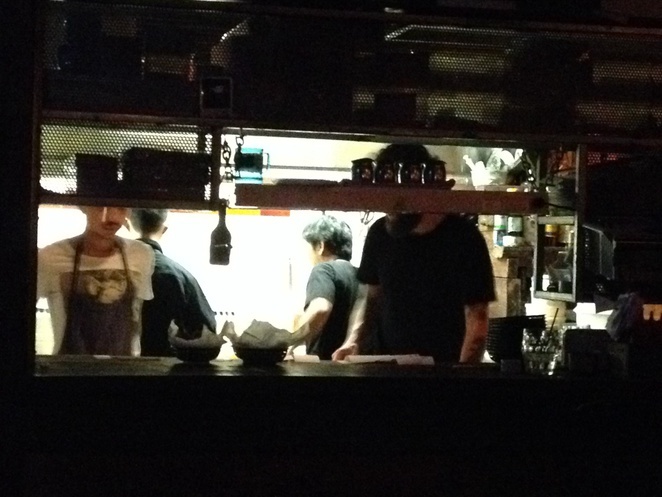 With credentials of Bodega, Porteno and Tetsuya's, the burgers and fried chicken are worth the wait even with all the confusion.